The spirit of the Eastern Band of Cherokee Indians is still legendary today. 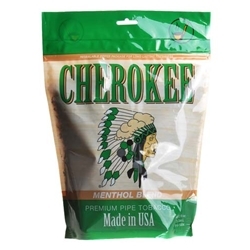 Fashioned after traditional Native American Indian tobacco recipes, Cherokee Pipe Tobacco is produced with a blended balance of rich and pleasant natural flavors comprised from Green River and Black Cavendish tobaccos. Each style is ribbon cut and air cured to perfection, giving every smoker a great taste and smell that will enhance their smoking experience. Pick-up any one of these great styles today at Smokers Discounts!